There has never been a better time to be a glaciologist. The old curse about living in interesting times, which is perhaps dubiously ascribed to a chinese saying, seems particularly relevant to science in general and ice and climate specialists in particular right now. We have access to a truly phenomenal range of resources that help us track the changes in the earth system; we can bounce radio waves off rocks buried under 4km of ice and use lasers to measure the height of clouds or the depths of a crevasse with decimetre precision. The GRACE and GOCE satellites whizz around the planet and the tiny relativistic accelerations and decelerations of paired satellites measure the seasonal ebb and flow of groundwater, snowfall and ice melt; and we can use the time signals of the GPS constellation of satellites to measure the millimetre by millimetre relaxation of whole continents as the glaciers melt. We do live in the future. The planet often seems to me to be very full of people and every corner well explored, but these new techniques still demonstrate that we have large gaps and science is probably the most fundamental form of exploration. This week a paper in Science demonstrated the importance of the freezing on of ice at the bottom of the Antarctic ice sheet (see this article on the BBC science page for a very readable summary). As a process it’s been well known for some decades that liquid water can exist due to the huge pressures under the ice sheets and that this does indeed freeze on at the bed of glaciers. The ice core drilled out of the Antarctic ice sheet at Vostok station lies directly above a lake roughly the size of lake Ontario, known as lake Vostok and shortly to be drilled into directly for the first time. The drilling hit frozen lake water some hundreds of metres before it stopped, with some intriguing hints of lifeforms found within the lake ice. 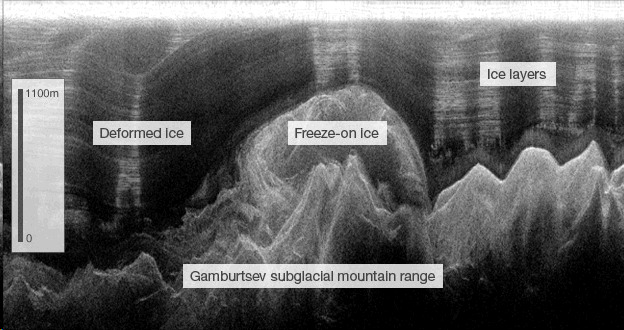 What is a surprise in the latest work, an airborne radar mission to the Gamburtsev Range (a mountain range the size of the European Alps in East Antarctica but don’t try looking for it on Google Earth because it is also, like Lake Vostok, buried under 4km of ice) is that up to 25% of the total thickness of the ice sheet in this area results from the freezing on of liquid water underneath the ice. This is largely because that water is squeezed up against the mountain sides where the ice is thinner and the pressure consequently lower. I first saw some of this work presented at a conference at Northumbria University in 2009, even then, when the actual data was still being analysed, it was clearly very exciting work with many implications for our knowledge of both process and feedback and implications. There are also some important implications for how we evaluate the state of the cryosphere, and neither this process, nor many others relating to how water flows over, through and under ice, what we term glacier hydrology, are captured in current ice sheet models. Of course, the old curse is famously double-edged, the reason we have access to such great tools and have been able to make so much progress is related to the fact that the climate is changing and the cryosphere is demonstrating behaviour of great concern to the millions of people who live in coastal regions or who depend on snow and ice for water sources. It is up to glaciologists to disentangle important processes from the trivial, to define the current state of the cryosphere and project how it will change. This new work shows just how much we still need to know and how seemingly trivial processes may complicate the picture. Just as well those satellites are continuing to fly.